We’ve wanted this baby for a long time. In Proud Daughter of Eve’s comment on my last post, she referred to a post I wrote back in August of 2006 about feeling ready for another baby after weaning Magoo. My heart was ready but my brain and body weren’t. If you’ve read this blog for long, you know I had a rough time after Magoo was born. You can follow this link to read the whole story but the Reader’s Digest version is, I was overcome with severe panic and anxiety disorder a week after his birth that caused a near complete breakdown and required serious medical intervention. He was also a huge baby, 10lbs. 8oz., and he ripped my body apart. I used walkers and canes and those little motorized carts at the grocery store, needed Dan’s help to dress myself, and went through some intense physical therapy. It was rough. We fought through it and when I wrote that post in 2006, I was mainly physically recovered and on brain meds and feeling good and really ready to continue our family. The timing just didn’t seem right. Although my doctor told me that I could get pregnant on the medication with little chance of even minor effects on the baby, I wanted to be drug free and proud before we tried again. A little over a year later I was off my meds and feeling great. I started working out and we began trying for a baby. In November of last year, I had what we think was an early term miscarriage and all the postpartum symptoms came flooding back. It was hard to want to keep going with our family plan and the idea of living life as a family of 4 became very appealing to me. I told Dan I thought I was done. He sweetly and calmly told me he didn’t think so. I knew he was right. Our family is not complete yet. The thought of waiting another 3 years to wean off medication before trying again was too much to take and I went back to my doctor to hear more about the studies and what they revealed about the safety of my anxiety meds. Satisfied, we went forward with our plan. When I’m trying to have a baby, I become sort of obsessed with pregnancy tests. I firmly believe that the more tests you take, the higher chance you have of becoming pregnant. Just keep taking them and one day one will be positive. In early January, it was that test-taking time of the month so I took a couple without achieving my desired results. A couple of days later I was dropping Magoo off with Eve on my way to a doctor’s appointment and I asked her if she had any spare tests lying around I could borrow. Then I did a stupid thing and asked her if I could use her bathroom. It wasn’t until after I’d peed on the stick that it occurred to me it may be positive. If it was positive, then Eve would find out before my husband. Not cool. “AAAAAAAAAA!” she screamed as she passed the receiver through the crack in the door. I dialed all of Dan’s 10 phone numbers and he answered none of them. Crap! So, I exited the bathroom and walked for the front door of the house without a look in Eve’s direction. “I will not speak to you at this time,” I mumbled. She followed me to my car, screaming like an excited cheerleader. I carried the stick in my purse for the rest of the day, too excited to think how disgusting that was. And soon I got a hold of Dan and we rejoiced and freaked out a little and I called my naturopath, my OB and my brain doctor. The team was in place. Brain meds were closely monitored. I was immediately put on progesterone because my levels were far too low for a pregnant woman and we scheduled my first ultrasound for the 8-week mark. Almost as soon as I started the progesterone, I began to feel nauseous and sick with the most miserable heartburn I’ve ever experienced. Honestly I hate that stuff with a passion. 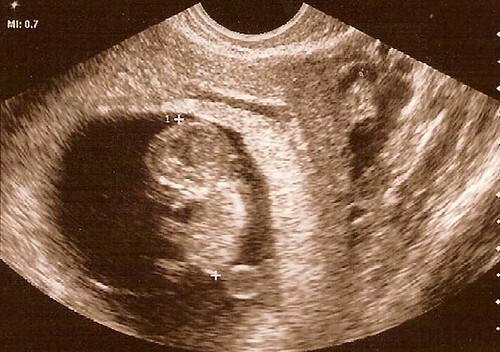 At the ultrasound, I was fairly sick but doing alright. Until we got a look at the baby. It was teeny, much smaller than expected. This meant that either my dates were wrong and I was pretty sure my dates were not wrong or that the baby wasn’t growing as expected. I tried to hold it together until the doctor left, telling me not to worry, that we’d just check again in 3 weeks to see if it had grown 3 week’s worth. Then I fell apart. I think I cried for 5 hours until I felt peace. Then we just waited. Each day I got sicker to the point where I was throwing up sometimes several times a day. The heartburn made drinking water painful and I had no energy, barely keeping down enough calories to function. The first trimester of my pregnancy is brought to you by PBS Kids and the Wii. I wanted to blog about what was going on but didn’t want to explain everything if things didn’t work out. I also have a hard time telling strangers about my baby when it still looks like a translucent seahorse with an alien-like melon head and nubs for arms. I want to be sure it’s human before I announce it from the rooftops… er internet tops. The ultrasound showed that the baby had grown even more than expected in a three week period and it waved its little flipper hand things at me wildly while its heart beat strongly and I felt my whole body relax. I’m due sometime in mid September. My sweet Wicked tickets are for the first week in September so hopefully I will have stopped barfing by then and not yet have dropped my load. The day after the show seems like a fine due date to me. Weight Watchers refunded my money and it turns out that the pregnancy bulimia diet is a much more effective form of weight loss than WW ever was so I guess it all worked out in the end. I’m still sick. I’m still spending more time lying down than standing up. I eat crackers a lot and sometimes they stay down. I’m grateful and nervous and excited all at once. And don’t get me started on the kids. Never in the history of the world have two kids been more excited about a coming sibling. First of all, its presence allows them to play video games until their brains rot, one of their greatest wishes. Secondly, they’ve been begging for a baby for years, wondering why everyone else gets a baby but us. They weigh in on names. Laylee likes Lucy and Daisy, Summer, Spring and Faller. Magoo is partial to names that remind him of “good sings” like Big Cheese, Light Bulb and Fred. I’m not sold on any real names yet but I’m already coming up with internet aliases. I’m thinking Kip for a boy or Wanda for a girl. Is it wrong that I think of their blog names first? Don’t answer that. This entry was posted in all about me, baby stuff, near-death, postpartum, weight loss. Bookmark the permalink. I’m 10 1/2 weeks pregnant with my first, due October 6th, and I’m very excited. I thought I’d had things rough with sickness, but now I see I’ ve had nothing! I hope and pray that it gets better soon. Hey! Congratulations on the pregnancy! And… um… I HEAR you on post-gigantic baby complications. My Boy was a hefty ten pounds, too, and afterwards was just lovely. But my next baby? Weighed a petite 7 pounds! No post-baby complications at all! One birth doesn’t predict the next, right? I should learn that when I’ve been neglecting my blog reads, it may be because HF knows I can’t deal with life. Congratulations though— really and truly. Even though I am so blastedly jealous. It’s crazy to be happy for someone but to be crying for you when you don’t even know them. Hormones are weird that way. Your below post. My list is long- but no luck yet. Maybe I should get some happy pills- since my doctor thinks I’m losing it. Big Cheese. That sounds good. Video games and blog aliases made me snort laughter through my nose. Just randomly stumbled on this and I just wanted to say, I hope you and your family are very very happy. You’re a funny writer and I really enjoyed your post. All the best to you!